In 2017-18, a major refurbishment project was undertaken on our church. The 175 year old roof-slates and tons of weathered stonework were replaced, and much of the ceiling plaster was renewed. See a series of pictures of the problems being tackled in our photo gallery. In 2014 our church needed a lot of repair. Inside, green netting was placed above the nave because sections of plaster were breaking away from below the roof. Outside, repairs had been done to slipped and broken roof slates over the years, but most of them were now too fragile and the whole roof needed to be fixed. 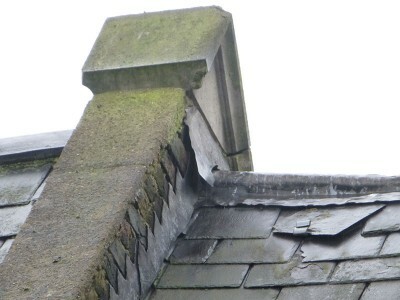 A survey in January 2015 showed much of the stonework, especially on the roof, needs repair or replacement. The work needed to be done as soon as possible, but it needed to be done well. St Peter’s was on the National Heritage List for England (Grade 2) because of its historical and architectural interest, but was now officially designated “at risk”. Our archbishop and the diocesan Historic Churches Committee required all the work to make the building as good the original, preferably better, with better insulation. The parish still had most of the £900,000 from the sale of the former St Catherine Labouré church. This amount would have fully covered the cost of the church repairs, but we would then have struggled to pay for other urgent work: replacing the presbytery roof and the boilers for church heating. The community centre, Pugin Place, was also on the National Heritage “at risk” List and would be the subject of a future major money-raising appeal. In March 2015, parishioners were consulted by questionnaire about applying for a £250,000 grant from the Heritage Lottery Fund (HLF). The HLF has to be convinced that when the work is done, many non-parishioners will be attracted to visit the church and appreciate our heritage. Of the 315 parishioners who responded to the questionnaire, the overwhelming majority (223) believed we should apply for the grant, and that visitors should be encouraged and made welcome. With this support from parishioners, we applied for the grant. In March 2016, the HLF endorsed the project in principle and approved an initial £43,000 grant to support the preparatory phase. The balance of £207,000 was approved in April 2017, enabling the work to start in May. As the whole programme cost just over £800,000, including design, surveys and technical evaluations, the parish still had to meet over £550,000 from its own reserves.